Many stock traders avoid the options market because of a perception that option trading is gambling. While it is true that every option trade may be considered to be a bet, a properly placed option trade can often reduce a trader’s risk rather than increase it. One method of reducing risk is to use options to initiate a stock trade, and one of the most common option trades – the covered call – can be used to accomplish this objective. Covered calls are often described as income-generating trades; an out-of-the-money call option is sold against a stock that is already owned and a trader slowly generates income as time decay causes the value of the option to decrease. By lowering the strike price of a covered call, to a level that is below the current price of the underlying stock, the nature of the trade becomes entirely different. The reasoning behind selling an in-the-money covered call may initially appear flawed. However, there are scenarios where in-the-money options are preferable. An in-the-money covered call is the equivalent of an offer to buy a stock only if it reaches a predetermined bargain price. Take Sourcefire (FIRE) for example. The stock has a long history of support around the $30 level, but experienced a significant breakout around $41 earlier this year. It subsequently soared to near $60 before giving up nearly all of the post-breakout gains. 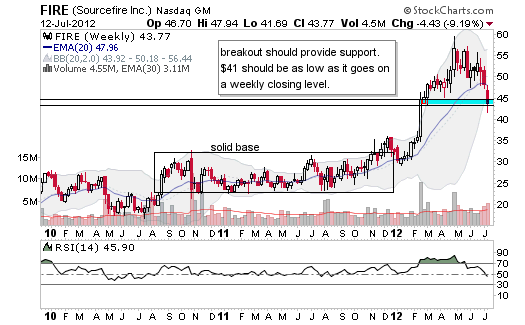 Often a stock that has broken out will bounce when it retraces back to the level of the breakout, in this case $41. A trader looking to profit from such a bounce would want to buy only if the price hit that “magic” number. Rather than wait for the stock price to hit the target, a covered call can be opened with a strike at the target price. Although there are no $41 strike options available on FIRE, the $40 strike is sufficiently close for this purpose. The trade is opened by buying 100 shares of stock at the current price and selling one call option at the $40 strike with July expiration. If the stock price does not fall below $40, the call gets assigned and the 100 shares of stock are sold. The trader keeps the time value of the option as profit. The goal of this trade, however, was not to profit on the option but to initiate a stock purchase. Sometimes it can take several attempts before the stock falls to a low enough price that the call option does not get assigned, each attempt returning a small profit. If the July call gets assigned, the same covered call can be opened again with August expiration, September, and so on. The trader will not retain ownership of the stock until the price falls below the predetermined $40 level. It is like getting paid to buy a stock at a bargain. The breakout price of a stock does not always hold as a new level of support. In the case of FIRE, a dip below $40 might mean that the price was headed even lower, to an earlier support level of $35 or perhaps $30. To protect a covered call trade, a put option can be purchased to limit the losses that would occur in such a dramatic selloff. When the underlying stock is trading in the low $40s as it is currently, the $35 strike put premiums are fairly cheap. Buying a put to protect a covered call is commonly called a collar. The result is similar to a covered call, but the $35 put acts as insurance in case the trade goes horribly wrong. In most cases, one would expect the stock price to fall below $40 – causing the call to expire worthless – and then bounce higher. But anything can happen, and using a collar instead of a covered call is a sure method of limiting risk. Using a covered call to initiate a stock purchase can tie up a lot of trading capital. This can become a burden when one considers that the trader does not actually want to own the stock until it falls below the target price. A trade involving 10 covered calls at the $40 strike and 10 long puts at the $35 strike would require the purchase of well over $40,000 worth of stock at the current price. In order to reduce the amount of capital devoted to this trade, it is possible to replace the covered calls with short puts at the same strike price. While it might seem complicated, the trade is actually quite simple. The trader sells 10 puts at the $40 strike and buys 10 puts at the $35 strike. Often this is called a bull put spread. Because the worst-case scenario on this trade would result in a $5,000 loss, that amount must be maintained in margin. But $5,000 is much better than $40,000, and the bull put spread is practically identical to the collar. If FIRE never reaches the $40 target, both put options expire and the trader keeps the credit received as a small profit. The profit may be repeated several times before the target price is achieved. If FIRE falls below the $40 target, the short puts get assigned and the trader buys 1000 shares in anticipation of a bounce. And if FIRE crashes, the trader buys 1000 shares at $40 and sells them for $35, exactly the same as the collar. The preceding is a post by Christopher Ebert, who uses his engineering background to mix and match options as a means of preserving portfolio wealth while outpacing inflation. He studies options daily, trades options almost exclusively, and enjoys sharing his experiences. He recently co-published the book “Show Me Your Options”.